This week’s recipe comes from one of our newer vendors, Brendan Patrick of Belle Chocolates. Long a chef, Brendan recently began making his own chocolates and decided to make his side venture a full time business. 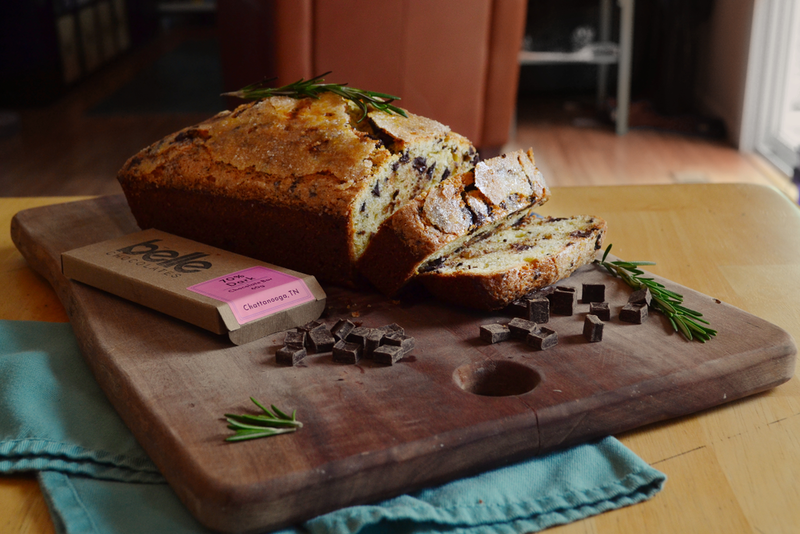 This recipe marries the bold flavors of rosemary (ask your farmer for some if you don’t have a rosemary plant of your own) and 80% chocolate into a bread that’s beautiful. Thanks Brendan! One of the things that led me to the world of Bean-to-Bar Chocolate making was the severe lack of commercially available chocolate that met my high standards for quality ingredients as a chef. But that is no longer a problem! Using locally made, Bean-to-Bar Chocolate will elevate any recipe you use it in. Now you can elevate your baking using high quality, organic chocolate, made right here in Chattanooga. Preheat the oven to 350F. Rub a 9” loaf pan with olive oil (and/or line with parchment paper). Bake for about 40 minutes, or until the top is domed, golden brown, and a skewer inserted into the center comes out clean. My cake, in the alternate pan, took closer to 50 minutes. Also, just when my cake was nearly finished baking, I decided I wanted a bit more color on top. I finished it under the broiler for a minute - which caramelized the sugar on top as well and gave it a bit of crunch. Don't walk away from the cake while it is under the broiler.